The introduction of a new problem-based Graduate Medical Course with over 230 students and more than 200 staff required a systematic process for induction into the PBL philosophy and tutorial process. 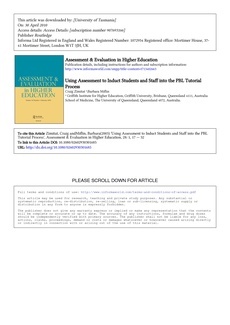 The 4SAT (4 Step Assessment Task) was designed for use as an instrument for formative and summative assessment of reasoning ability, elements of the PBL tutorial (group) process and individual learning outcomes. The instrument was developed through evaluative cycles based upon staff and student feedback, reflection and peer review. The 4SAT has face validity with the learning process and emphasises reasoning and integration of knowledge. An unexpected out come of its development was its use as a powerful tool to induct staff and students into the PBL group processes, scaffold development of hypothetico-deductive reasoning and provide guidance on the depth and breadth of learning expected in the course.